Air India has added a new 787-8 to the fleet today, as VT-NAA. Give it two months and it will look tattier than a Saha Air 707.
my wife flew in an AI 77W yesterday and she told me that walking through the plane felt like walking down one of Dharavi's bylanes. It was that messy. Surely, keeping the cabins and the loos clean is the most basic thing than an airline can do? 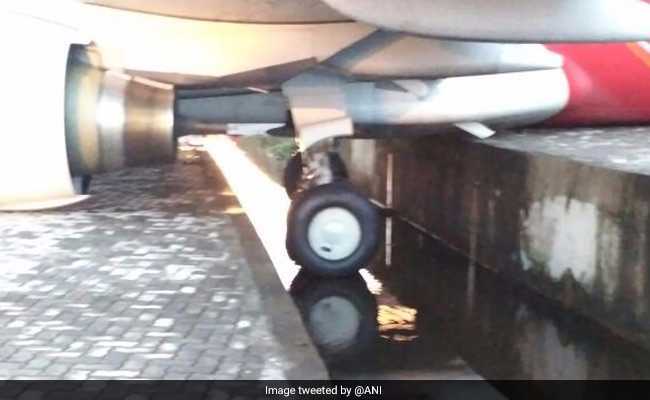 An Air India Express aircraft went off the taxiway and rolled partly into a drain after it landed around 2.40 am this morning at the Kochi airport in Kerala. All 102 passengers were evacuated safely from the Abu Dhabi-Kochi flight with a ladder. Airport sources say the plane took a turn too soon - about 90 metres before it was supposed to - while approaching the parking bay and went off track. Images showed a wheel of the Boeing 737-800 aircraft stuck in what appeared to be a drain. "All passengers were evacuated through ladder. All are safe. No casualties," a Cochin International Airport spokesperson said. The livery on those AIX planes is strikingly wonderful. Pity about some of their pilots though. Air India will launch nonstop flight between Delhi and Copenhagen September 16, 2017. This thrice-a-week service will be operated on Boeing 787 Dreamliner on Tuesdays, Thursdays and Saturdays. The Danish capital will be AI's 44th international destination and 11th European non-stop destination. "To mark this new service, the airline is offering attractive return fares starting from Rs 42,700 only, inclusive of all taxes. AI 157 will depart from Delhi at 2.30 pm to reach Copenhagen at 6.45 pm the same day. The return flight AI 158 will leave Copenhagen at 8.45 pm and reach Delhi at 7.35 am the next day. (All times local)," AI said in a statement. Air India has deferred the delivery of at least one A320 neo aircraft due to issues with the CFM-manufactured engine, sources said. The development also comes at a time when no-frills carriers - IndiGo and GoAir - have grounded at least 11 A320 neo aircraft due to problems in their Pratt and Whitney engines. Airbus 320 neo, the new engine option, are more fuel efficient and Indian carriers have placed orders for more than 500 such planes. The A320 neo planes of Air India and Vistara are powered by CFM-made engines while those of IndiGo and GoAir run on P&W engines. Sources told PTI that Air India has deferred the delivery of at least one A320 neo plane due to problems with CFM engine, probably the first instance of these planes facing woes on account of CFM engine. Specific details could not be immediately ascertained. Queries sent to Air India spokesperson on Thursday remained unanswered. When contacted for comments about Air India deferring the delivery of aircraft on account of CFM engine issues, a spokesperson for Safran Aircraft Engines in an e-mailed statement said, "I regret to inform you that CFM does not want to comment." CFM is an equal joint venture between US-based GE and France's Safran Aircraft Engines. It manufactures LEAP and CFM56 engines for commercial planes. "We are working closely together with the engine makers and our customers on next deliveries, which are agreed with the customer," an Airbus spokesperson said in an e-mailed statement. The aircraft for Air India are powered by LEAP-1A engine manufactured by CFM. Currently, the airline has eight A320 neo planes in its fleet. The national carrier took delivery of the first LEAP-1A- powered A320 neo aircraft earlier this year. Air India has plans to lease a total of 27 A320 aircraft, including neos. Air India has a fleet of 112 planes. Recently, Civil Aviation Minister Ashok Gajapathi Raju said technical snags faced by A320 neo aircraft operated by IndiGo and GoAir pose a "safety issue". "Obviously, any failure is a safety issue. So, the operating procedure we changed... What is attractive is fuel efficiency. Fuel efficiency is one thing and risking life is another," the minister had told PTI in an interview. His comments had come in response to a query on whether the P&W engine issues were a safety concern. The aviation regulator DGCA has asked the American engine maker to expedite the supply of spare engines to India. On whether there could be harsher action with respect to the engine issues, Raju had said some of the planes have been grounded because of regulations, implying that existing norms are strict. "Why are they grounded, that is because of the regulations. You don't want to take risks with life... Everybody is working on it (addressing the engine issues). As long as glitches don't massacre human beings, it is okay. They will be addressed and sorted out," he had said. Alliance Air has added a new ATR72-600 to the fleet today, as VT-RKG. 3,250 crore to meet "urgent working capital requirements", according to a document. for "urgent working capital requirements"... not good. The body parts found over a month back on Mont Blanc in the French Alps and believed to be belonging to the passengers of an Air India plane which crashed here in 1966 or a previous AI crash at the same place in 1950 could remain unidentified. France has told AI that the human remains are so old that conducting a forensic exam may not be possible. The country will hold a memorial service next month in wake of the July-end findings of the decades'-old crashes. "The French justice department has told (us) that forensic examination of the human remains found recently on Mont Blanc (believed to be from an AI crash in 1966) may not be possible as they are very old. The Mayor of Saint-Gervais will organise a remembrance/meditating ceremony in presence of embassy of India and AI officials at the memorial dedicated to victims of the crash. AI has been requested to attend this ceremony," AI spokesman G P Rao said. The airline will attend this sombre memorial as it had swung into action as soon as it had got news of the human remains being found on Mont Blanc. While in the past also, some aircraft parts have been found, this was possibly the first significant finding of human remains — a hand and the upper part of a leg. Five years back, a bag of diplomatic mail that was on board AI's Boeing 707 which crashed in 1966 was found. The jute bag stamped "diplomatic mail" and "ministry of external affairs" with some Indian newspapers, was found in August 2012. A year later, a French Alpinist found a metal box containing the AI logo and precious stones at the site. The climber who found the human remains in July felt they could be of a female passenger from the 1966 flight, as he had also discovered one of the plane's four jet engines. AI was trying to get details of the latest findings. An Air India Express flight covering the Pune-Dubai route may soon stop operations about 11 years after it started operations. The flight — the first international one from the city — has been making losses, a top official of the company said. "We are losing a lot of money on the flight. However, we are yet to make up our minds. We should be able to take a final call in a week or two. SpiceJet has got daily flights from Pune to Dubai," K. Shyamsundar, the CEO of Air India Express, told TOI. The official admitted that bookings from November onwards were not being accepted. "The bookings on the flight are open until October-end. However, we have stopped taking bookings for November," the official added. Though Pune airport authorities had said that they are encouraging airlines to start international operations from Pune, no airline company has yet finalized the plans for the same. An official said, "We do not have clear information about the Air India Express flight, but it is a fact that airlines have not been very keen to start international flights from Pune despite encouragement. However, we are hopeful... any airline can come out with an announcement soon." An official said since Dubai is the gateway to the West, fewer direct flights to the destination from Pune was a trend that needed to be arrested. "An official of the AI Express has not given any specific reason. If the flight has been running on losses, rather than just shut it down, the officials must make the flight more competitive," another official pointed out. Looks like all India-DXB routes are not money printers. So even though the bilateral is fully used, does it really mean Indian carriers are making money or are they just squatting on flights (which is their right but does not justify increasing seats). AI can now reallocate these seats to a city that needs capacity to DXB (clearly they seem to be having issues finding that city - which speaks volumes to me). 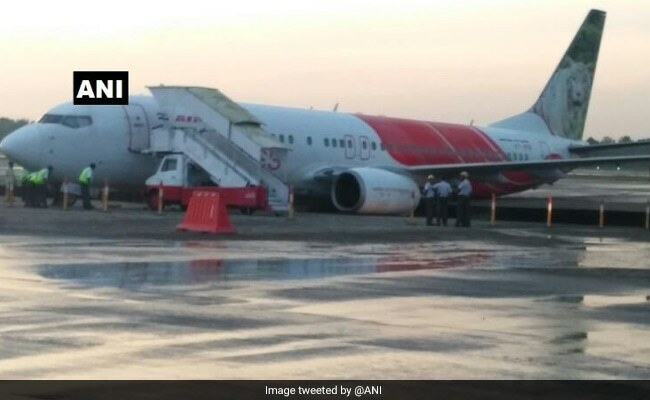 An Air India plane hit a truck carrying a ground cooling unit at the international airport here as it was taxiing towards a parking bay. There were 114 passengers onboard the Airbus 319. No one sustained any injuries in the incident, an airline source said. Air India has added a new A320NEO to the fleet today, as VT-EXI. Today marked the launch of commercial services to the country’s newest airport – Shirdi International Airport. The airport at temple town of Shirdi saw its first commercial departure being flagged off by President Ramnath Kovind earlier today. The services are being operated by Alliance Air – subsidiary of National carrier Air India, which will operate daily services between Shirdi and state capital Mumbai and also between Hyderabad and Shirdi. Both the flights will be operated by ATR72-600 aircraft. The temple town of Shirdi is famous as the home of Sai Baba of Shirdi and sees devotees across religions throng the town. Prior to the commissioning of Shirdi airport, the nearest airport was Aurangabad where Hyderabad based carrier Trujet operates daily flights with onward bus connections to Shirdi. It will be interesting to see if Trujet will shift its Aurangabad service to Shirdi. The town itself has a very small population but estimates suggest that the floating population of devotees ranges from 50,000 to 4,00,000 daily and this large number is what would capture the eye of the airlines to start services. Shirdi Airport was expected to be operational in 2011 with capacity to handle ATR aircraft. Maharashtra Airport Development Company (MADC) the owner of the airport decided to extend the runway to 8200 feet to accommodate A320/B737 aircraft – which will help launch direct flights from major metro cities in the future. The apron can accommodate two A320/B737 type aircraft or four ATR72-600. However, this expansion of the runway was funded by cutting down on the expenditure for the terminal. A terminal with basic facilities was given a go-ahead instead of the glass and steel structure envisioned before which is synonymous with many Airport Authority of India’s modernised terminals in recent years. The basic structure of the terminal comprising re-enforced steel panels and pre-fabricated industrial shed material could well become the future of low cost terminals which will come up in smaller towns across the country. The airport becomes operational with a small terminal which will expand to over 3000 sq mtrs in phase II. This next phase will also see availability of night landing facility and is expected to take around a year to complete. The traffic at Shirdi will be comparable to another temple town – Tirupati which sees services from Air India, Spicejet and Trujet. Both Shirdi and Tirupati could see interest from market leader IndiGo in near future when the airline inducts its ATR72-600 aircraft starting next month. With the launch of scheduled services to Shirdi, Maharashtra has six airports which see scheduled services. At its peak, Maharashtra had seen operations at Mumbai, Pune, Nagpur, Aurangabad, Nashik, Solapur, Kolhapur, Nanded and Latur. The non-operational ones currently are part of the Regional connectivity scheme (UDAN) of the government and there is likelihood that they would see service resumption in near future making Maharashtra one of the top states in terms of operational airports. The last Greenfield airport in India was Durgapur and it is struggling to attract airlines as well as traffic. I hope the blessings of Sai Baba be with the Shirdi airport and Air India – the first operator at the airport. Sir, thanks for a nice analysis. 9I has the first mover's advantage here, and the SAG market is quite different from TIR. SAG has potential (it is code 3C compliant) in case the traffic picks up, right now 9I and its AT7-6 services are perhaps the best from the economic viability point of view. only workable solution IMHO! Let SPV deal with the debt, atleast there won't any further drain of resources. If this is true, and there is really no fine print, it will make AI a very attractive investment. I suspect that if they were to allow a 51% foreign ownership, Lufthansa group would be really interested. New Delhi: Tata Sons Ltd executive chairman Natarajan Chandrasekaran has said the Mumbai-based group is considering buying state-owned flag carrier Air India Ltd. The group, however, needs more details from the government on the process, Chandrasekaran told CNBC-TV18 in an interview, which was released Monday evening. Chandrasekaran indicated the group was keen on the airline it once started. “We have a team which can definitely spend the time as soon as the details are out,” he said, adding, “We need to look at aviation as a whole. We are subscale. We got two airlines both are subscale. Any decision that we take—Air India or otherwise—we have to have a story because we can’t be operating with 15 aircraft or 20 aircraft. I feel scale is important, in every industry in every group we operate in scale is important. Without scale you get to a situation where you are all over the place and it is very, very difficult to pay management attention." Tatas have launched Vistara in alliance with Singapore Airlines and AirAsia India. Vistara has said it will place wide body aircraft soon to fly international. Tata chief said Air India would be a “strategic decision” and therefore “data” and “long term story is required”. He also indicated Tatas have looped in Singapore Airlines to potentially look at Air India jointly as they had in the past but failed then. “Do you think I would not have?” he asked, in reply to a question on talks with Singapore Airlines, but declined to comment further. This is the first formal statement by Tata Group on Air India since the government announced its decision to sell the airline earlier this year. Mint reported on 21 June that the group has sought details of the Air India disinvestment in meetings with government officials. In 2000, Tata group and Singapore Airlines had expressed their interest in acquiring up to 40% of Air India. In 2013, after a meeting with then aviation minister, Ratan Tata had said the Tata group would be interested in buying a stake in Air India if the government were to privatize the airline. Air India was launched in 1932 by J.R.D. Tata as Tata Airlines. Its name was changed to the current one in 1946. The government decided to take it over in 1953. Air India since last week has switched operational aircraft for Delhi – Washington Dulles route on permanent basis, with 777-300ER operating 3 times a week since 06OCT17. The Star Alliance member in yesterday’s schedule update extended the -300ER operation into winter 2017/18 season, until 24MAR18. The following schedule is effective 05NOV17. Air India has added a new (it's 27th and last) 787-8 to the fleet today, as VT-NAC. Apparently, it's because the 77L used on the route "Kerala" is off for maintenance (hopefully a C or D check because the IFE and lavs are in a woeful state). Air India has added a new A320NEO to the fleet today, as VT-CIG. What is the status of the 744s ? A few months ago, I saw one of them without engines and in a state fit for scrapping at BOM. Are all 5 currently active ? 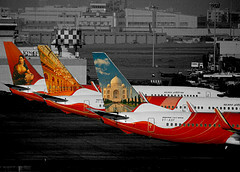 Boeing and Air India celebrated today the delivery of the airline's 125th airplane from Boeing. The airplane is the 27th 787-8 Dreamliner for the national carrier. "Boeing airplanes are, and always have been, the foundation of Air India's fleet, providing us with the very best in economics, fuel efficiency, flexibility and passenger comfort," said Rajiv Bansal, Chairman and Managing Director, Air India. "Taking delivery of our 125th Boeing airplane and 27th 787 Dreamliner marks an important day for Air India. The 787 has been integral to our expansion and competiveness, enabling us to open numerous new and nonstop routes and provide our customers with an unrivalled flying experience." "Boeing and Air India have been strong partners in aviation for more than 70 years and it is a proud moment in our shared partnership to deliver their 125th airplane," said Dinesh Keskar, senior vice president, Asia Pacific and India Sales, Boeing Commercial Airplanes. I think AI had six owned 744s. VT-ESM, ESN, ESO, ESP, EVA and EVB. according to airfleets, -ESM and -ESN are stored. The one without engines that you saw could be either of these . -EVA and -EVB are being used for VIP ops. Don't know about -ESO and -ESP. They both last flew in 2016. The one you saw is VT-ESN. It's in the corner of BOM that is usually reserved for parting out of aircraft. That leaves only Four AI 744s flying now. VT- ESO, ESP, EVA and EVB. Theres only one scheduled Commercial 744 rotation - BOM-HYD-JED-COK-JED-HYD-BOM - which sees a B777 now and then. Apart from that, the 744s do VIP duty (usually a pair of planes), wildcard Domestic flights (BOM-DELs, DEL-MAA, etc.) and the Hajj Charters. I checked on FR24, all four airframes are active, having flown substantially in the last week. From 28NOV, IX will cease Kolkata ops for the second time, terminating both Kolkata-Delhi/Singapore. Thanks a bunch for the info - very helpful. in layman's language Agra, Velha Goa, Konark and Ajanta are active, where as Tanjore is on its way out. Konark (VT-ESM) was written off after the #4 engine fire in 2009. But the other four are still active, yes (Khajuraho, VT-ESO, is the one you missed out). Remember when the 744s were to be retired in October 2009 ? One of our former members also wrote a trip report of the farewell flight. It's been 8 years and they're still hanging on. With most major international carriers retiring the 744 in the past few / next few months, I wonder how long the AI 744s will be around. If Two 744s need to be kept airworthy until then, it makes sense to use the other two as well for running errands here and there for as long as is feasible..
Are two specific 744s earmarked for VVIP duties ? Im guessing AI just needs to keep any two 744s configured for VIP duty at any given time. All four frames have done VIP-duty stints in the past, as can be gleaned from the many pictures and videos online of Air India One at airports around the world. VT- EVA has been the 'chosen one' for the last few months..